The step pyramid and the plain pyramid. There were universally accepted seven wonders existed in the world, the pyramids are the only member still standing there without any damages, the main reasons being they (Pyramids) are the most stable structures capable to resist the forces of nature like wind, rain and earth-quake and as they were made of granite blocks they could resist sun and rain. The forerunner of the true pyramid is the step pyramid and of the many step pyramids built most of them perished. One in full shape left is that of King Netjerykhet Djoser. As not appealing to eye of the onlooker; its construction was discontinued. Pyramids have always remained as wonder and they were not in need of the approval of a committee hence the government of Egypt did not think it necessary to propose pyramids for approval. The committee yet selected them as unopposed as a world wonder in the recently held voting event for selecting the Seven Wonders of the World. There is not anything special of selecting the pyramids as wonders as they always were there to the wonders of the world while of the seven wonders pyramids alone survived the test of time while the other six perished. Architecturally speaking pyramids are three dimensional polyhedron structures with four sides tapering upper part and broad base. 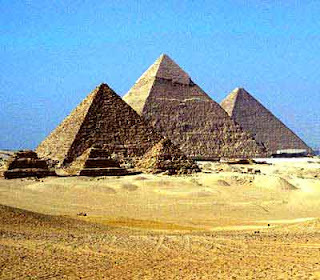 In Egypt (Pyramids are found in many other countries like China, American continent, France and Sudan etc. Pyramids found in one locality differ from those of the other. The difference is not only in the materials chose but in the design of the structure. The Pyramid of Chichen Itza Mexico belonging to the Mayan Culture is one typical example of this (it also is one of the wonders of the world). 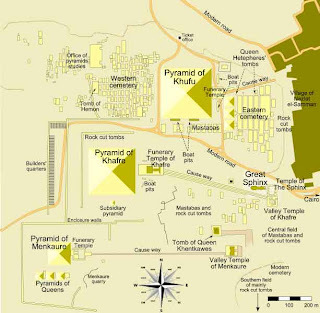 Khufu, Khafre and the Red Pyramid. By volume the Pyramid of Cholula in the state of Puebla, Mexico was numero uno, which is represented only by its remnants. The Pyramid of Khufu remains top in height and style of construction followed by that of Kafre and the Red Pyramid respectively occupying second and third places (The Red Pyramid -located at Dashur Necropolis- which was originally 473 feet in height has lost much in the passing time at present only 450 feet). 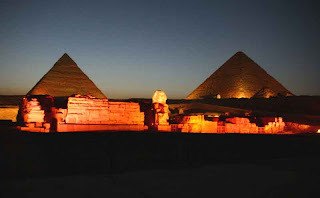 In Egypt Pyramids lie scattered in the following places from North to South Giza is the richest as it is endowed with the most important ones like that of Khufu’s and Khafre’s Pyramids. In front of the Khufu’s Pyramid stands (sits) the Sphynx the legendary lion with human head (its head is assumed to be that of Pharaos). The Pyramid of Khufu with the Sphynx in front has gained the symbol of Egypt and it remains to be the main attraction of all sights in Egypt. Giza, Abu Sir, Saqquara, Dahsur, Lisht, Meidum, Howaira, El Lahun are all places where pyramids were present (much of the in the form of utter ruins and a source for collecting stone for local population). These structures were monuments built for the peaceful living of dead souls by the ruling cults belonged to the Solar and Stellar kingdoms who ruled Egypt. Time of construction is not known but assumed to be between 26th century BC and the fag end of first century BC. Considering the size of these elaborate structures built it has been estimated that about 400 years would have taken for the making of the massive ones. As per the customs of this cultures the cremation of the dead were done in very unusual manner. First the internal organs of the dead-bodies were removed and cavities stuffed with certain preservatives of those times, body embalmed with linen and coated with perfumes and other materials believed to have magical powers. Internal organs cut off are kept in earthen jars and also preserved. Brain from the skull removed and replaced with resin and saw dust mixture. These embalmed mummies are kept in pyramids to see that the soul at the time of rebirth should not wander for a body. It is a strange phenomenon that these mummies packed thousands of years back still remain intact. If these pyramids are monuments for the dead royal family members where these royal families lived (their palaces must be far grander than their dead member’s cove) but there is not even a trace of those palaces left. All attempts of archaeologists to trace the remnants of the palaces were futile and assumptions are available in this regard. How come that when tombs of the dead remain intact the palaces where people lived vanished in the thin air! It seems strange that the accurate number of pyramids existing in Egypt is still not confirmed, Karl Richard Lepsius an expert who conducted a survey recorded 67 numbers but that was years back and many more have been later found, now it is estimated that they number between 80 and 111, most of them located in remote corners and getting looted mercilessly for the mere stones of which they are formed of. How was such massive structures built at that time? There is no scarcity for intrigue as far as these pyramids are concerned! The Khufu’s Pyramid was made of 230,000 blocks of granites some of the blocks weigh about 9 tons how these gigantic blocks of stones were lifted and placed in such heights? No one could give a satisfactory answer, some argue that huge pile of sand hill made and these block of stones were pushed and rolled through over the sand hill ramp. If such a sand hill ramp has to be made it should at least be miles in diameter and seems almost impossible to conceive. Some people are of the view that wooden frames were used to lift the stones the fact is no one knows actually how they did it! Pyramids and the modern times. Pyramids have been subjected to robbery even from the ancient times most of the culprits being the very laborers who built it. The jewels and other costly items enclosed along with the coffin was the main reason for that. Those who live nearby take away the stones for their personal use thereby depleting most of the pyramids to untraceable levels! The latest problem is the tourists who flock to it draw and write on it as well as do many things that tarnish the sanctity of the structures. A very interesting story of yet another pyramid is doing round in Bosnia Herzegovina near Yugoslavia. There a hill (pyramid) of about 2120 feet high with sharp four corners each of 45 degrees has been claimed as a pyramid by one Semir Osmanagic (a young Bosnian American businessman). This ‘structure’ has many things like underground pass ways (2.50 miles length)with carved stone lining and blocks of stone shaped like those of pyramids. With the local coal miners he made some excavations and many valuable discoveries have been made. Aly Abd Alla Barakat an expert from Egypt has certified that there is something for serious research on this. If found to be genuine it would be the tallest pyramid on earth! 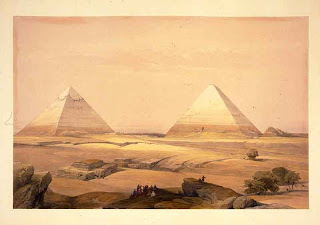 Lithographic print from the 1840s depicting the Great Pyramid and neighbouring Khafre's Pyramid. Pyramids remained as the largest manmade structures for millennia and only in 1330 AD their position for first time got challenged by Lincoln’s Cathedral which was built as the tallest building of that time occupying a ground area of 13 acres. At present building a massive structure is not such a challenge in the age of latest building technology. Even a structure built hundred times grander than pyramid today using modern technology cannot claim to match the original work. Even discovering or devising the technique the ancient people adopted for building them at that time still remains unknown. Do you think there is any truth to the theory that the three main pyramids represent the constellation stars of Orion's belt? The last several months have been crazy. I am a bit late on several things including my sincere thanks for your visit to the Existentialist Cowboy. And thanks for your kind comments. I have placed a link to your blog on my blogroll. Keep up the important work that you are doing. Thanks for sharing this post. The Great Pyramid of Cholula is a largest monument in the world and it listed in Guinness World Records. Pyramid of Cholula was constructed by one of the seven giants known as Xelhua. Cholula is a highly significant centre of the Mexican. YOu can see very attractive taludtablero patterns coloured in shades of red, yellow and black with insect- shaped creations that are typical of Teotihuacan technique.